If only my htpc project would run over consecutive days... Unfortunately I was unable to get hold of all things I needed in the first order so I had to order some things at another online store, which at the time of ordering were supposed to have the hardware in stock. Well, after two weeks I finally got the things I had ordered: The Silverstone Nighjar 300 watt passively cooled (as in "no fan") PSU, the iMon VFD and remote for the mCubed hFX and a Hauppauge WinTV PVR 150 MCE tv tuner card. This beauty doesnt make a sound, while still performing well! Time to start again. Open the box and had to take out everything again. First the drive brackets, which now fortunately will be easy to refit now that the DVD is aligned correctly to the front. Then the motherboard had to go out, simply because the case has a rather silly design for fastening the PSU. The bracket that goes over the PSU has two screws in the bottom which are half hidden by the motherboard! Oh well, getting used to taking the motherboard in and out again now. Hopefully I will only have to do it one more time when the heatpipe cooler arrives. Peekaboo... one hidden screw there. The VFD display, which also acts as an IR receiver for the remote, is easily fastened with 4 screws (normal hd/dvd/cd drive kind). Then I had to read the manual carefully so that every wire was connected correctly. A neat feature of this VFD is that it will continously get power from the PSU even when the computer is turned off. 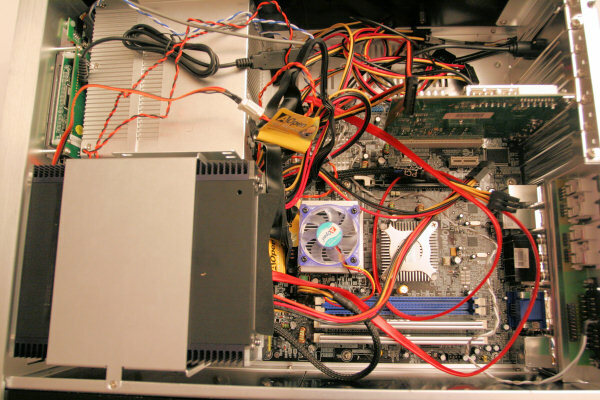 This is done by adding a cable to extend the power to the motherboard. As if the power cable wasnt long enough as it is!!! Having power on the VFD enables it to display a message there all the time while powered off as well as you being able to turn the computer on using the remote - a handy feature indeed! Only thing lacking is that I wish there was a clock on the VFD that could run while the computer was turned off. This latest version of the VFD uses only one internal USB plug for both the IR and the control, unlike previous versions which were connected to the printer port. Also since the VFD can listen to the remote for a power on/off command, the power connector in front is connected to the VFD and then you connect a wire from the VFD to the power pins on the motherboard. All in all a pretty easy and straight forward installation. The PSU was then mounted using the mCubed bracket. I applied some thermal paste to one side so that it has better contact with the heatsink which it is supposed to be mounted towards. 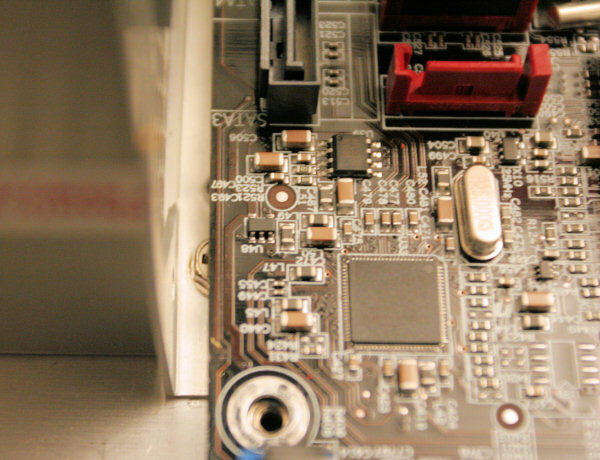 Unfortunately, the bracket doesnt seem to have any way of ensuring that the PSU is actually pressed onto the heatsink. Might have to add some metal sheets inbetween there to make sure the contact is good. Knowing that a PSU generates quite some heat, I have to be sure this heat escapes the case somewhat. I then added the motherboard, connected the power cable and added the tv tuner card to a free slot. Its now you realise how much cables there are and begin to wonder where to put them all. Fortunately they have designed the DVD/hd cage in a such a way that you can have a small bundle of cables running underneath the DVD drive. Still you have to bend the cables somewhat to form a snake to fit it all, and then have the rest of the cables comin out between the DVD drive and the motherboard close to the PSU. If you want to clean things up a bit, it might be wise to bundle some of the unused cables up with a string and add some "socks" to keep the others together. Everything installed - cables all over the place! I then plugged everything in and booted up. Everything was working fine, and one fan less to worry about! Now I only need the Borg 479 heatpipe kit for the processor. Its getting hot in there! The Harddisk gets very hot! 48 degrees idle after 3 hours according to SpeedFan! From what I have read on the net, you should try to keep it below 40 degrees. As it passes 50 degrees you risk the chance of disk failure! Definitely need to do something about this. As I see it now I have 2 options. 1) Get a 2.5" laptop drive instead. 2) Buy a new Borg heatpipe cooler for the HD soon to be released. The CPU heatsink doesnt even get warm to the touch, while the CPU easily idles at 54 degrees even after undervolting it to 1.1 volt. This indicates that the heatsink doesnt have the necessary contact with the CPU die to do its job. Looking forward to getting that Borg heatpipe cooler soon! The DVD drive can generate quite an amount of heat in the system after spinning at full speed, eg after ripping 5-6 CDs. In my case it was actually up to the point of my CPU alarm going off, as the CPU reached 70 degrees! 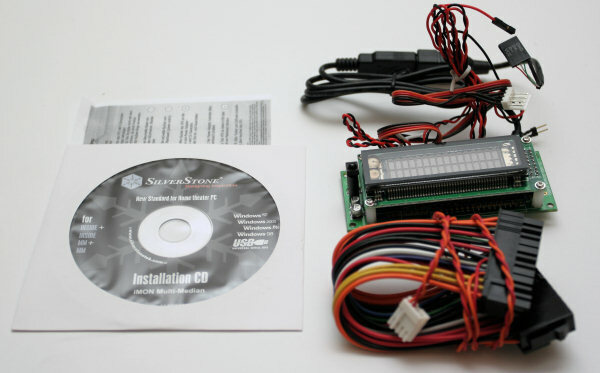 Hopefully this wont be a problem when the heatpipe is installed for the CPU and I plan to install a program that can lower the speed of the DVD when playing back CDs or DVDs. There is no need for it to run at full speed in those cases. The PSU doesnt get hot at all! After 4 hours I opened the case and touched it, and couldt feel any heat at all. Probably around 40 degrees or so. This is good news indeed, as I had thought that the PSU would be a major problem in this case. 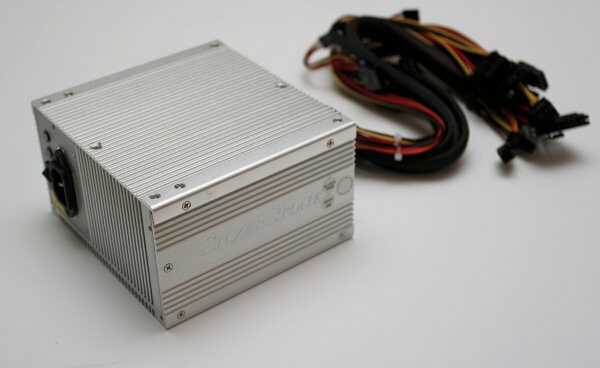 It might also be that the heatsink transfers the heat away very well for the PSU as it is now. Or it might just be that my system doesnt draw much power at all (below 100 watts). The venting holes on the back of the case is a nice feature, but unfortunately doesnt help much for the heat from the CPU since its placed a bit into the case. However, for the tuner card and eventually the graphics card, those holes will help out since heat rises in the air and would then go straight out of the case.